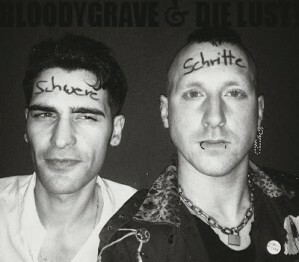 XWave Radio » Bloodygrave & Die Lust! How did you guys met and started making music together? Ben: We meet in Berlin in front of a club. He just came to me and asked me: “Do you play any instrument?” And so we decided to meet each other the next days. Frasco was jamming with a lot of different people. First project he formed was “Rotten Western Kulture” or RWK with our friend AC. Even if your music really speak to me and I love the sound of Deutsch vocals in music, I must admit that I don’t understand much of your lyrics. Can you tell us about the most recurring themes and topics in your songs? Ben: We also perform one of Frascos songs in Italian by the way! ;-D But… I cant tell you one straight answer. Its about different things… some are more “SciFi” or even with funny content. Some are more questioning things or pointing at things like the last 2 big nuclear catastrophes, one is even political or an other one is about what we’re afraid about what the future society could turn into… so really a lot of different topics or nonsense. Your music obviously brings punk aesthetics and feelings. Were you both into the punk scene before getting into electronic music? Ben: I never considered myself as punk or anything… I was always interested in subcultures and liked to get around and meet different people. And in my teenager years I started to hang out in locations or punk/metal/Oi!/Ska/Rockabilly…etc concerts and in every “scene” which represents some kind of attitude without just being a fashion-trend, I can found something interesting for me. I like the subculture all in all. Frasco: What I believe is “There is not Authority but Yourself”, the DIY way of the things, and create instead of destroy. What I consider Punk isn’t necessarily a band with bunch of spikes on the leather jacket or vomiting on the stage. A rebellion as something that want to change to a better stage, because ideals and burning energy for let the things happens, not wait that someone will build something for you. This is my way of be and been Punk. The rest do not impress me, since mostly is a matter of appearance. About the music it can consider Punk the way to play and express myself for an urgency that is unstoppable, and actually “Lust” is one of my favorite words.. Which punk record have you been listening to the most in your life? Ben: Gosh… there might be many… I like different kinds of “punk” music… even some minimalwave tracks can be “punk” in my kind of taste. since i am very interested in electronic instruments i started looking for synthpunk-elektropunk bands. 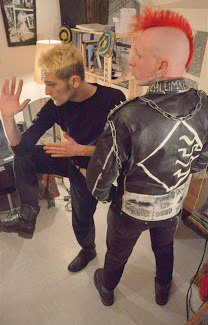 In style of punkrock i am a big fan of Schleimkeim, Telekoma, GG Allin, Unicef, Demented Are Go and everything raw, rough… best with violent vocals!! Frasco: Some of my all-time favorite are the first two album of the Italian band CCCP, My War from Black Flag, specially the guitar of Greg Ginn is pure raw expression; the firsts two album of the Wipers. Also the drumming of Penny Rimbaud from Crass is unbeatable…the early works of DAF since the end of the 80s… I heard the songs of Negazione on the Split Tape “Mucchio Selvaggio” 1000 times in the past… these are the names that I have in my mind at the moment. I think Frasco had to move back in Italy a little while ago, so how do you still manage to collaborate together? Frasco: Yes I am here in my hometown Florence after many years of traveling and satisfy my want of knowledge. Nowadays it is actually not so important where you live since you have many contacts and you can fly easily everywhere, with some organization. We are still at work for our new album, that will need some more little time, and I invited him to record his voice here in Florence, at a Studio here next to Florence, where other guys from Berlin like Jemek Jemowit did his record. We have also some gigs together on the Calendar, like the Young and Cold Festival the next September. I don’t care about not have Gigs often now, is a deep exploring time, more intimate, and a big new wave will splash again soon..
I’ve heard that when you first started composing together a creative flow took place very naturally. Can you tell us how it happened and how are you usually working together? Frasco: For my experience and for how I am, the better musical expression is always coming out from improvisation. This is a natural attitude, not a method that will work for everyone every time off course, but improvisation and experiencing with, is a fundamental way of expression and a invaluable pleasure. RWK and our duo are consequently expression of energetic fun about playing, and everything we did until now is born thru the improvisation, when more when less. When thinking about all the gigs you played in the past, where did you have the most fun? Ben: Definitely both gigs in Paris!! At the first show there, at a totally overcrowded club, the Bunkerbal Party, i got to close to the edge of the stage… some people in the first row ripped my shirt to shreds! 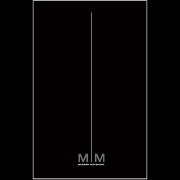 Are you planning a new release anytime soon? Any other gig dates are confirmed yet? Frasco: There is a plan for a new LP Album that will name “Schwere Schritte” (literally “Heavy Steps”), that will collect some singles that we already release, and brand new songs, that are in form of sketches now. The distance between us have delayed the process off course, and this new Chapter of my life changed really much about my way to think about music creations: the shape is not anymore the big pot Berlin that nowadays is a huge art-magnet, but a little big city that have one of the most important history in the world. I am sure, when this point arrives, the new LP will be a welcome surprise for new coming ears and who slowly start to think that maybe nothing will happens anymore with this project. There is the Gig at “Young and Cold Festival” in Augsburg (near Munich) that is a Festival that is getting bigger at every edition and is organized from friends of us. The lineup is very interesting and I really will like to go there even if I would not play. Would you like to add anything else or spread any message? Frasco: New Wave is not dead! Theres always the Newest! Posted on June 1st, 2014 under Interviews, Bloodygrave & Die Lust!